Can I Transfer Songs From iPod/iPhone to Computer? Have you ever wondered if you can transfer songs from your iPod/iPhone to your computer? The answer is yes! However, you may face problems if you intend to sync with more than one computer using iTunes. There are a lot of restrictions with Apple’s software, and you don’t really have control over your music. What can you do? Can I Transfer Songs From iPod / iPhone to Computer? The best way for “can I take songs from iPhone/iPod to computer” is by using more flexible third-party software. By using this kind of software, you have a lot more options than you would if you just tried to use Apple’s proprietary tools. Your songs are set free, and you can transfer them to any computer you would like, and ever to other devices with different Apple ID’s. It is a good idea that you can enjoy your purchased songs on different devices. Step 1: Download the TunesMate software and install it. Plug in your device. Step 2: Click on the “Music” tab at the top. You will see different categories at the left-side menu, songs, iTunes U, Audiobooks and Podcasts. Choose one. Step 3: Select which songs you want to transfer then click “Export” to choose a destination folder. “Can I transfer songs from iPhone/iPod to computer?” iMyFone TunesMate says yes and more can be done. It is one of the best device managers out there. 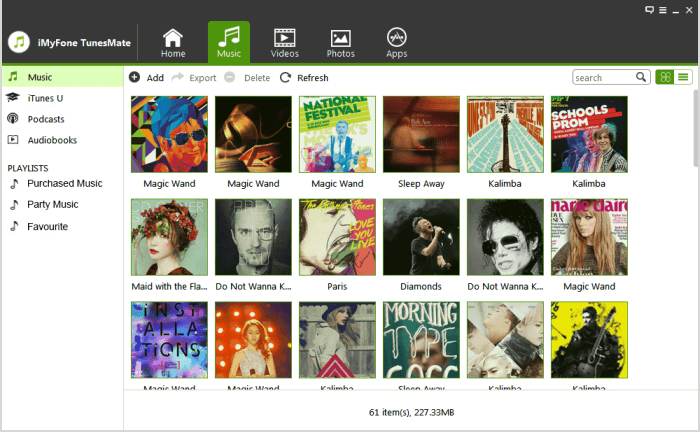 It can help you organize your songs and transfer your entire playlist. You can transfer songs between your device and computer, between two iOS devices, and even between device and iTunes. You can choose to back up your songs all at once, or you can transfer files one at a time. It gives you musch more freedom than Apple’s native apps like iTunes and iCloud give you. Best of all, you don’t lose any quality when transferring. iTunes gives you ability to transfer songs from iPod/iPhone to iTunes and vice versa. However, you cannot selectively do so. What you can do is to transfer all data. What’s worse, can I transfer songs from iTunes to iPod/iPhone? Yes, but the current songs on your device will be covered. You will lose you current songs. But with TunesMate, you will not have such restrictions. You can transfer which songs you want. You can rebuild your iTunes library but not mess it up. You can add songs from iTunes to iPod/iPhone without losing the current songs. You can transfer pictures, videos, and just about any other sort of file. TunesMate isn’t picky about the file types and doesn’t have any restrictions about what kind of files you transfer. You can manage the files that are on your device much more easily than you can from the iPod’s interface. You can look through all the files and preview them. You can easily back up all of your files with just a few clicks using one of the shortcuts on the program. You can manage more than one device, and finally share data between many difference Apple devices. It works with every iOS device, including iPhone, iPad, and iPod, and it works with both Windows and OS X. It is much more lightweight than iTunes, so it loads faster, and it’s also much easier to use. Not to mention it has much more functionality. You can transfer files that you might have never been able to using iTunes. There are huge advantages to using a program like TunesMate to manage the files on your devices. Besides the obvious fact that it is more powerful than the alternatives and that it gives you more control than Apple’s software, it’s also just easier to use. The interface lets you transfer files in just a few clicks, and it often takes many more steps to do the same thing on iTunes—if it will even allow you in the first place. So if you’re looking for the answer of “can I transfer songs from iPhone/iPod to computer”, consider an application like iMyFone TunesMate to make things a lot easier on you.